Groovv register can print to either a network connected printer, a Bluetooth printer or a USB printer. Touch this drop-down arrow to lead to a long list of Groovv compatible printers, which have the #/cols (characters per column), cutter, drawer, color and start print codes necessary installed for easy and accurate installation. Simply select the proper make and model for your printer. Groovv Deployment only supplies the AZT Printers All and Bixolon SRP-305 ii models. With an existing WiFi router. Just configure the printer to use your wireless router. Using your phone as a Hot Spot. This will not require a WiFi router, but is an extra monthly charge on most carriers. It will also use more battery power on your phone/tablet. Bluetooth printers can be connected directly to the phone/tablet, and do not require any other networking devices. 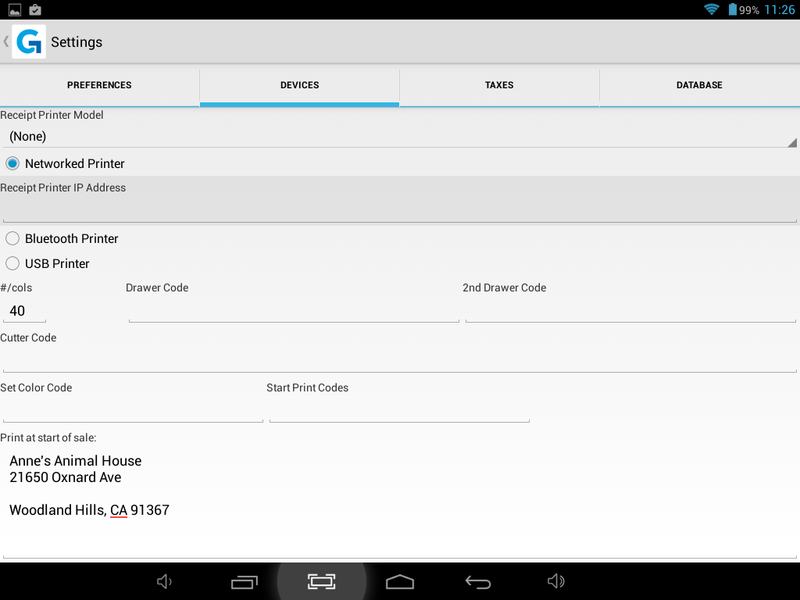 Bluetooth printing works well on Android 3.0 and above devices, and should work on most 2.2 and above devices. The printer needs to stay within 15-20 feet of the phone/tablet to work consistently. Bluetooth Printer Name - Touch this drop-down arrow, leading to all Bluetooth devices already paired with your tablet/register. USB receipt printers can be connected directly to most devices running Android 3.1 and above. You need a special USB Host Mode or USB OTG (On The Go) cable. This cable has a USB Micro male on one end, and an USB A female on the other end. Please check your documentation that came with your device to make sure it supports USB Host (OTG) Mode. USB Printer Name - Touch this drop-down arrow, leading to all USB devices paired with your tablet/register. #/cols - The number of columns your printer uses in the default font. This is normally 40, but could be less on printers with narrower paper. 2nd Drawer Code - Same as above. Should you encounter an issue with the auto populated code please contact support. Cutter Code - Same as above. Should you encounter an issue with the auto populated code please contact support. Set Color Code - Same as above. Should you encounter an issue with the auto populated code please contact support. Start Print Codes - Same as above. Should you encounter an issue with the auto populated code please contact support. Send Drawer Open Command - If checked, the system will send the open drawer code at the end of all sales. Always Print Receipt - If checked, the system will print a receipt at the end of every sale. Barcode Scanner Name - Touch this drop-down arrow leading to all Bluetooth devices paired with your tablet/register. You must Save your changes before any of these updates will take affect on your tablet/register. To save your edits simply touch the Save button. After saving you will then be able to touch the Test Printer and Test Scanner buttons. This will Test the devices you have recently added to this tab. It also gives you the opportunity to validate that the device(s) have been set up properly. For help replacing paper within either of our provided printers, please visit our article on Replacing Printer Paper. Currently, only (1) printer can be defined and used as a receipt printer at a time.